An evening of English Stand Up Comedy at Dialogues Koramangala. 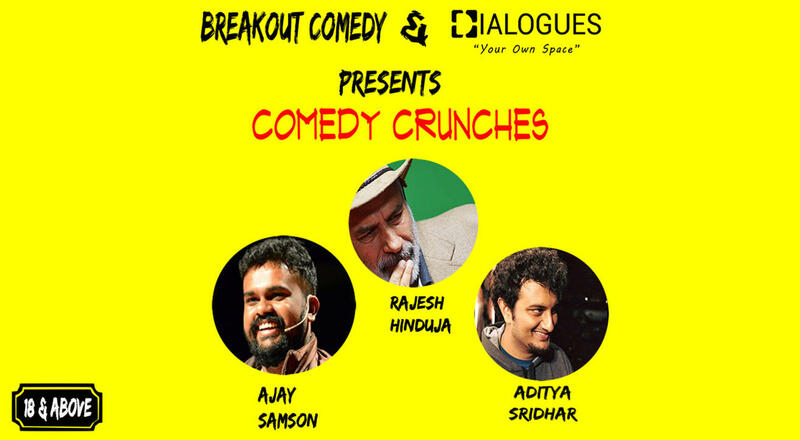 Served at a very reasonable price will be hilarious comedy by some of the best comedians in Bangalore. Rajesh Hinduja who took to comedy rather late in life after discovering a hidden talent for it. Apparently, the talent was hidden so deep down, it took a while to emerge !! Confused till today about only two things, women and technology. And when he has to deal with both together, the result can be seriously funny. Ajay Samson is a Bangalore based stand-up comedian. His comedy is local and lovable, just like his city. He is the winner of Comedy Central Chuckle Festival in India and is well-known for his performances alongside the famous Russel Brand and Vir Das. Aditya Sridhar is doctor by day, comedian by night. Aditya Sridhar has been writing comedy since he was 16 and performing since the last 2 years. His jokes revolve around his life and his observations of the same.